ASTANA – Assembly of People of Kazakhstan (APK) Mother’s Council and Duslyk Tatar Educational Cultural Centre head Yannat Nizamutdinova is a person who seeks constant development. She thinks young people should move with the times while at the same time remembering their culture and traditions. 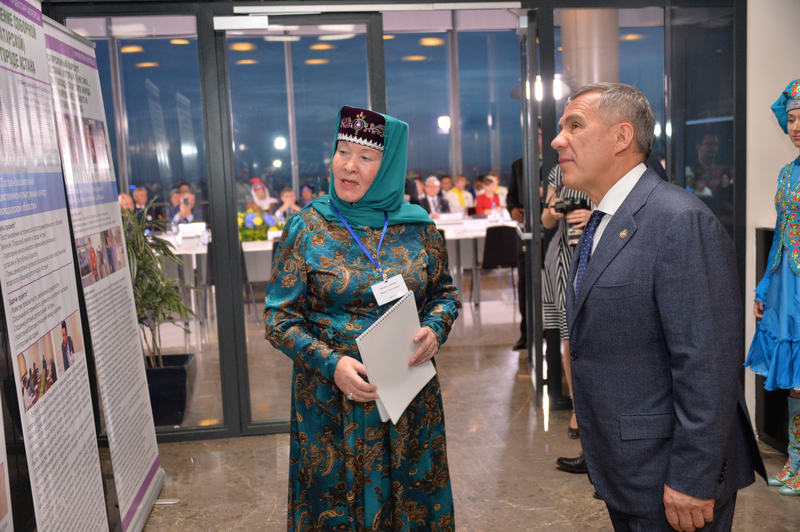 Yannat Nizamutdinova with President of Tatarstan Rustam Minnikhanov. Photo credit: assembly.kz. After her eighth grade, Nizamutdinova left her Tatar village in Bashkortostan to study in Tselinograd, later Astana. “It was not easy for me to do [that] in those times. First, I spoke only the Tatar language; I understood Russian but could not communicate freely. Secondly, there was nostalgia and I greatly missed my home. By then, the locals spoke mostly in Russian. If I heard Kazakh spoken, I was very happy, (because) approximately 90 percent of words coincided with Tatar. I felt among kindred spirits,” she said in an interview with assembly.kz. She studied economy and after graduation, worked at large institutions such as Kazakhstan Temir Zholy, the Kazakh Parliament and General Prosecutor’s Office. Thinking about her post-career activities, Nizamutdinova decided to change the direction of her life by entering Karaganda State University named after Yevnei Buketov to specialise in psychology. Currently, she is a theology student at Russian Islamic University. “It was a difficult decision, because I was a clerk and I doubted whether I could work in another area. After all, my age is also not small. I analysed, looked at active and successful women who are retired and… stopped at the fact that I am a woman and women’s issues are close to me. Gathering like-minded people, unanimously we decided to create a women’s organisation, the Centre for Friendship of Women of the World, where I was elected the chairperson. Later, [I was also elected] the head of the Duslyk Tatar Educational Cultural Centre,” she said. Yannat Nizamutdinova. Photo credit: assembly.kz. Nizamutdinova founded the Duslyk Centre in 2014. “Opening the centre, I was faced with the question why. There was already the Tan Tatar-Bashkir Centre in the capital, which has been leading its history since 1994 and in which I have worked for many years. By the way, I am still the vice chairperson. However, there were interesting projects that required special attention, a separate study, and the new organisation took care of them,” she noted. Every year, the centre organises a number of events devoted to the birthday of Tatar poet Gabdulla Tuqay. 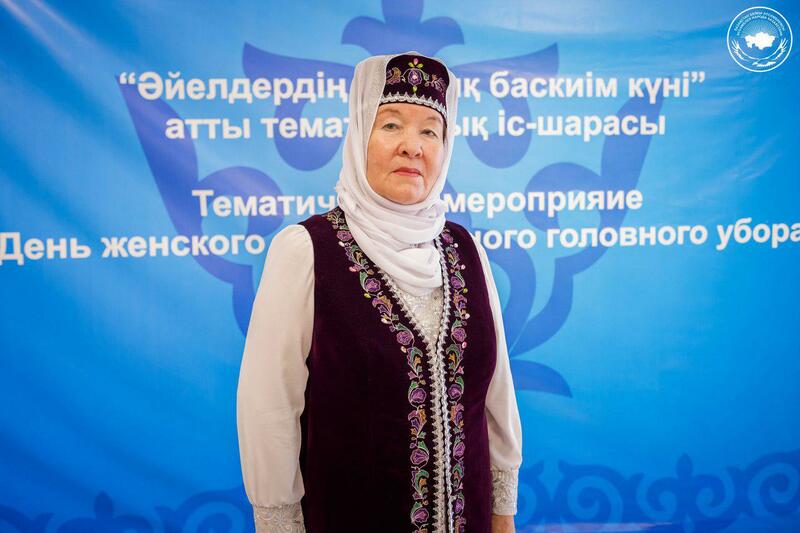 “Our Tuqay’s spring was recognised as one of the best projects at the World Tatar Youth Forum in Kazan and recommended as exemplary for implementation in the countries of Central Asia,” she said. The centre works to preserve artworks of prominent and famous Tatars. It published the collection of poems by Musa Jalil in Kazakh, Russian and Tatar and for the last three years has organised a national literary competition among school, college and university students dedicated to his artwork. The competition received international status Feb. 15 and was renamed the Zvezda Jalila (Jalil’s Star) International Literary Competition. “We will continue the cycles of literary evenings where we intend to discuss both individual works of Tatar authors and the development of modern Tatar literature. We plan to create similar meetings [related to] music,” said Nizamutdinova. The centre also conducts tours to historical and sacred places within the capital for young people, the centre’s Sunday school students and their parents, children from low-income families and the older generation. It also cooperates with many universities in Kazan (the capital and largest city of Tatarstan) including Kazan Federal University, Kazan National Research Technological University and Russian Islamic University, by helping interested people receive information. Nizamutdinova stressed one of the centre’s most important projects is restoring the Green (Tatar) Mosque in the capital, built with Tatar merchant Nurken Zabirov’s funds at the end of the 19th century and destroyed during the Soviet era. This project is a part of the Sacred Geography project of the Ruhani Zhangyru (Modernisation of Kazakhstan’s Identity) programme. “Today, only the old fence at the intersection of Republic and Abai Avenues reminds [one] of it. Kazakh citizens and President of Tatarstan Rustam Minnikhanov supported the initiative, but, unfortunately, it has not improved much. We carried out a number of activities, searching for archival documents and correspondence with local authorities,” she said. “I dream that historical justice is served and the mosque that our Kazakh brothers built in the 19th century together with the Tatars will take its rightful place and decorate our beloved city,” she added. Nizamutdinova is a member of APK, head of the Ak Kalfak Council of Tatar and Bashkir women of Kazakhstan and member of the capital akimat (city administration) family and demographic policy administration. She has received many medals and diplomas including the APK Birlik Gold Medal (the highest award of the Tatars’ World Congress) and medals for Great Service to the Tatar People, the 20th anniversary of Astana, 20th anniversary of the independence of Kazakhstan, 20th anniversary of the APK and in memory of the 110th anniversary of Musa Jalil.